Reception of the Dell Streak 7 could be described as “meh” at best. I went all-in on the device when I switched to T-Mobile at the beginning of the year, as, at the time, they did not have a mobile hotspot in their lineup. My time with the Streak 7 has ranged from feelings of being happily hipster (that feeling you get from rocking a device that the other techies will not use) and and being utterly frustrated. Most anyone who has kept up with the Android hacking crowd has heard of DJ_Steve of the XDA Developers forums and has seen or heard of the fruits of his labor. Earlier this week, I finally got around to taking some of his work for a test run. My Dell Streak 7 had degenerated to an all too frustrating level and before converting it over to paperweight duty, I decided to try one last desperate act and make the attempt to load a custom ROM onto the device. Fortunately, DJ_Steve has been working on a version of Honeycomb for the Streak 7 for the last several months and he has the customized OS operating at a very stable level. While the WiFi-only Dell Streak 7 is set to receive an official update to Honeycomb in the near future, the T-Mobile variant may never receive such an update, making the HoneyStreak custom ROM the only option for getting Honeycomb onto the device. A quick refresher. Android is an open source OS, meaning that, for the versions preceding Honeycomb, the source code has been available to the public. The Honeycomb branch is not yet fully open source, and only the SDK is available. Still, the SDK allows developers to make tweaks and apply the OS to devices in ways that the OEMs did not originally plan. By compiling the source along with other classes, developers are able to apply these custom images to devices to enable additional capability. 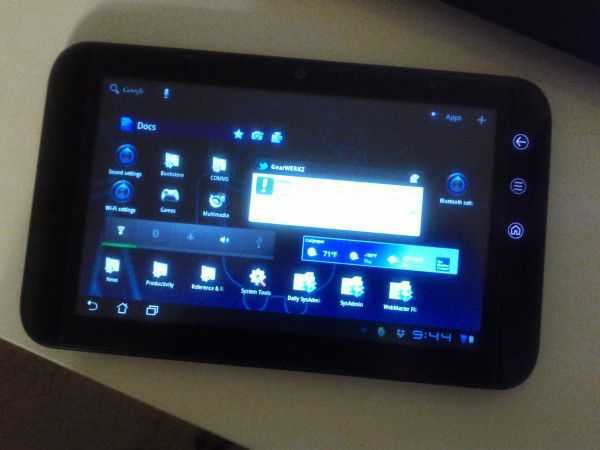 In the case of HoneyStreak, DJ_Steve pulled some code off of an Asus Eee Transformer, merged that code with a compiled build from the SDK and some source he wrote on his own, and, with the help of some other XDA members and several months of hard work, produced the HoneyStreak package. The build is available via the XDA Forums and, with a little work, can be applied to the Dell Streak 7 to produce an entirely new experience. I say a little work because, as you hit the various sites to follow the required steps, everything may not go as planned. You can read my full write-up over on my personal blog. There were some harrowing points in the sequence, and a few times, I thought I was either going to wind up with a bricked device, or that the flash would just not work and I would be left with the Streak running Android 2.2.2. See the video below showing the performance and some of the features from another round of testing this morning. Overall, I am pleased as pie. The Streak was on the verge of being retired and I was to be left without a 7 inch tablet in my arsenal. With the application of the HoneySteak ROM, it has catapaulted back to a device that I would love to carry with me all of the time. Because I am in the process of retiring my System76 Starling netbook from active duty, the Streak 7 is likely to become my “grab-it-as-I-am-running-out-of-the-door” device. In order for that assignment to take place, I need to do some additional testing, particularly with Bluetooth keyboards and mice, and see what will work. Hopefully I will get some time to do that this weekend. Peep the vid and sound off in the comments if this makes you consider picking up a Streak 7 on the cheap as a viable alternative to Acer’s just launched Iconia Tab A100 or another 7 inch Android device. It may not be the right fit for some, but I am willing to bet there are a few readers out there who are willing to take the plunge to save a few ducats.